Ride like the wind or hitch a lift on his bike and be protected while looking good! 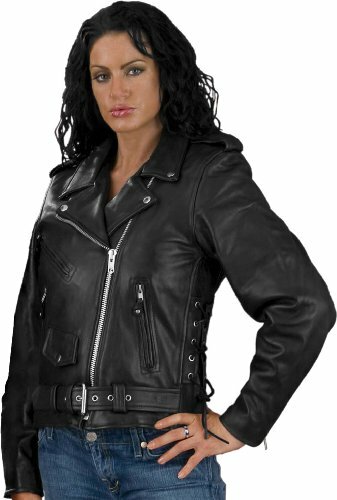 This is a Biker Girls' Leather Jacket. 1.2 MM Premium Milled Cowhide Leather is easy care, water resistant and most spots wipe right off. It will wear well over the years. Leather and stitching are best quality. Plain Side version look for LC2701 style. Features Original YKK Silver Hardware, 2 Outside Zip Pockets plus Coin Pocket, 1 Inside Pocket, and one Snap Closure pocket for additional storage . Half Belt, Zip Sleeves and Zip out Liner. Crossover Front closes up to neck when cold and collar and lapels snap down to catch the breeze or look cool. We suggest buying one size larger for comfort. The a half belt adjust the fit smaller where needed.